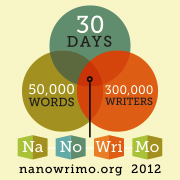 This year, one of my New Year’s resolutions was to participate in the National Novel Writing Month. It’s a marathon of sorts, where a group of crazies writes 50,000 words in a month. It being foolhardy, it was perfect for me, and something I’ve wanted to participate in for a few years now. 50,000 words in a month is 1,667 words a day, and so far my goal is to reach 2,000 words a day. But it’s the first day and so hard. So, please expect hiatuses punctuated by lots of whining on my part. I am dedicated to doing this, and it is pretty exciting. Wish me luck.